This tour is a combination of all the helicopter tours in St. Augustine, 98 miles from Orlando, making it the most comprehensive tour available! You'll depart east from the airport over the intracoastal waterway to North Beach, then enjoy a thrilling flight down 17 miles of beautiful coastline, taking in Vilano Beach, Porpoise Point, Conch Island, Bird Island, San Jose Forest, Menendez Park, and St. Augustine Beach and Fort Matanzas! Returning to the airport along the Matanzas River, marsh and intercoastal waterway, you will catch a bird's eye view of the St. Augustine Lighthouse, the Bridge of Lions, the Castillo de San Marcos, Flagler College, and the Nombre de Dios Mission as you take in the Old Downtown on your way back to the airport. A truly memorable way to discover all that St. Augustine has to offer, from above! 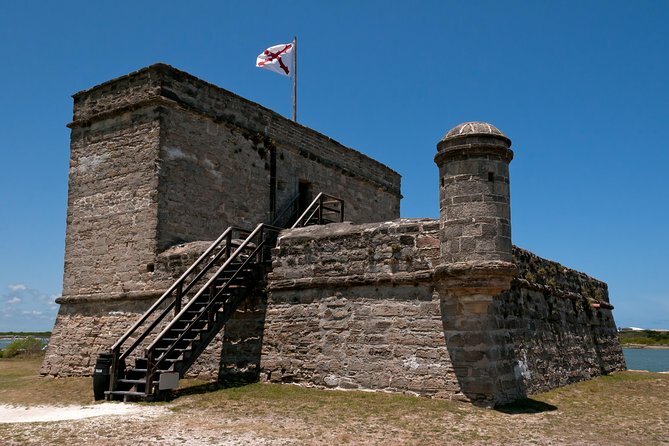 Fort Matanzas and Old Downtown Tour. Please enter your desired departure time in the Special Requirements box at check-out. Maximum weight per person is 300 lbs (136 kg). For groups of three (3) passengers, total passenger weight must not exceed 550 lbs (249 kg).